The links to the images don't work for me just a blank page when I click on them so not sure if this theory is there or not. It does look like Charleston is the best location for image 2 I've seen so far. The map in the mask fits really nice to the waterway near Drum Island. Also the smaller mask really does seem to be referring to Fort Sumter. If you google Fort Sumter there is a flag pole dead in the middle. Anyone still working on this book? Anyone in the area that could post pics of parks? I'm interested in your thoughts on Drum Island. There's certainly a lot of images links floating around for the book. An Ebook supposedly exists. I had two copies of the book but I recently gave them away. I'll share any links as soon as I might find them. 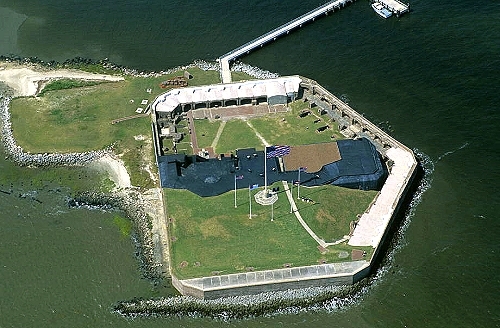 Here is a image of Fort Sumter, that fits the shape of the smaller mask. Here is a image of the Charleston Waterway that matches the pattern in the larger mask. If you notice the coordinates are 32.7833N , 79.9333W which numbers can possibly be picked out of the lion's mane.